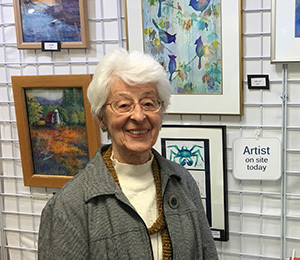 Arlene Mortimer’s watercolor and pastel paintings describe many scenes and landscapes familiar to those who live in this area. Capturing not only the basic image she sees, but the underlying feeling or impression of a certain place is what she attempts to achieve with each painting. Arlene prefers to use her own “plein air” sketches or photo’s for reference material to help her get from seeing to painting. She says, “The sounds, scents and feelings I get by visiting a site and enjoying a physical presence has a lasting emotional involvement that helps add to the enjoyment of getting paint on paper. It’s much more fun to paint something that I “owned” for a moment and has made me feel happy or peaceful or nostalgic. Her wish is that you, the viewer, can feel this too.